The chunky bits of salmon are the stars of this recipe. Cooked in stock, with the smokiness of bacon lardons and finished with single cream and chopped dill, this is a supremely tasty dish. 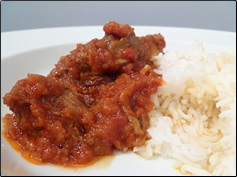 I serve it with creamy mashed potato - a super simple recipe for a cold winter evening. This is a two part recipe. In part one we set the salmon and potatoes cooking. In part two we finish everything off, make the mash and serve. 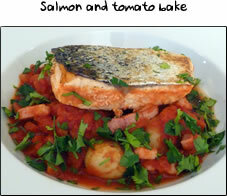 Before you start, have the onion, bacon, salmon chunks, stock and potatoes ready. Put a large pan of salted boiling water on the hob for the potatoes. Put a large frying pan on the hob on a medium heat and click here! Before you start, drain the potatoes and pop them back in the saucepan. Have the butter, milk, chopped dill and masher ready to hand and click here! Put a large pan of salted boiling water on the hob and throw in the potatoes. Boil for about 15 minutes until they're soft enough to mash. Once you've put the potatoes on, put your frying pan on a high heat with about a teaspoon of oil. To the frying pan add the chopped onion and fry gently for about 30 seconds. Stir in the bacon lardons and cook for about 2 minutes until the bacon has a little caramel colour on the outside. 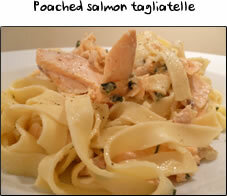 Pour in the fish stock and stir, then add in your salmon chunks. Add a small pinch of salt and pepper and gently stir before reducing the heat and putting a lid on the pan. Simmer with the lid on for about 10 mintues until the pototoes are ready to mash. Once you've drained the potatoes, pop them back in the saucepan and take the lid off the salmon pan. 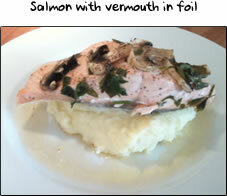 Turn the salmon up to a high heat so that it bubbles away whilst you make the mash. Bash away at the potatoes with your masher, getting rid of any lumps. Add in a knob of butter and stir until melted. Pour a splash of milk in and stir to loosen. Add more milk, a splash at a time, to get the required consistency. Lastly add a pinch of salt and stir. 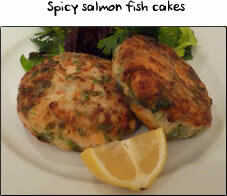 Turn the heat off the salmon and gentlystir in about 50ml of single cream and the chopped dill. 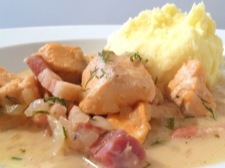 To serve, put a nice dollop of mash to 1 side of a large bowl and divide up the salmon and sauce.